Amongst the blushes I have tried in the past, there are rarely any high-end blushes that I found flattering enough on my skin tone (NC 40). Except the Chanel Joues Contraste Blush in Pink Explosion which I have grown absolutely fond of and also this fabulous blusher that I will be reviewing today from the house of Marc Jacobs which looks marvelous on the Indian skin tone or dusky beauties in general. 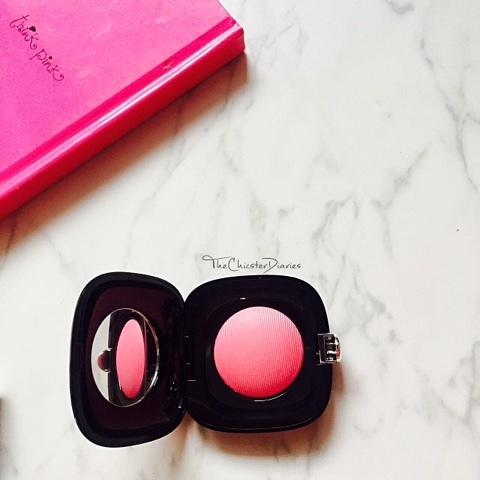 A vivid, silky blush in a stylish compact that delivers bold color and unprecedented vibrancy. A custom faille design pressed into the powder matches the outer silk faille pouch. 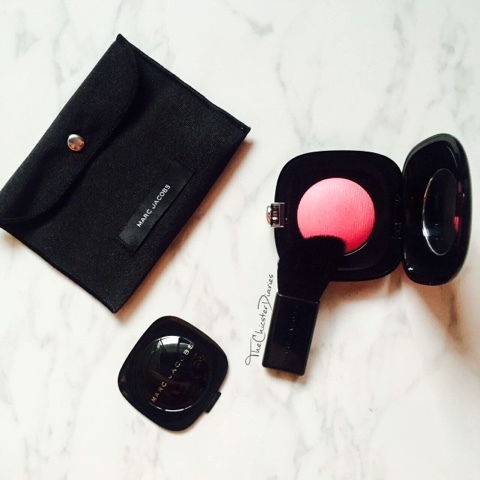 Packaged with a portable blush brush, dot mirror, and an exaggerated button for easy compact closure. 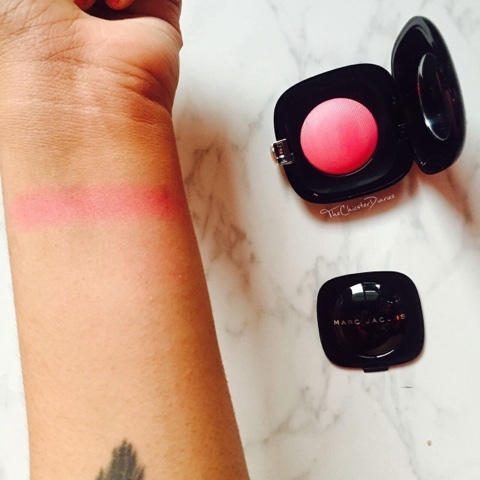 Inspired by Marc’s tattoo, Shameless Bold Blush gives you permission to pursue all the wrongs that feel so right. Petite on the outside, but generous on the inside, this patented powder brings an unprecedented vibrancy to your cheeks. Unlike traditional powders, Shameless Bold Blush melds with your skin and enables you to sculpt perfect contours. The formula is infused with bio-lipids and essential amino acids, which create the powder’s ultra lightweight, silky texture and ensures a seamless application. Choose from shades of unexpected, unadulterated colors—all inspired by Marc’s bold spirit—to create a look that is powerful, lavish, and shameless. 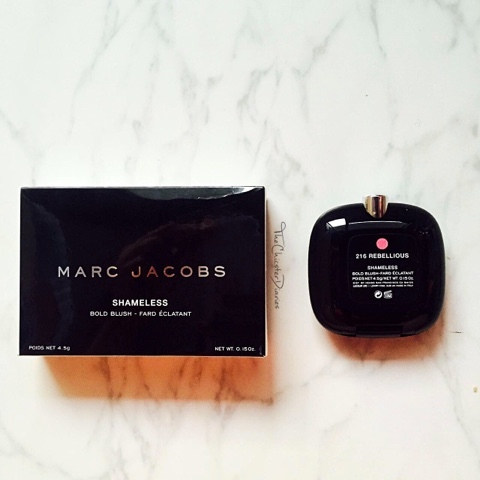 Packaging: The blusher is housed in a square box with round edges that has Marc Jacobs written on it. The compact comes with an exaggerated push pin lock system that is easy to use, also the size of the product makes it absolutely travel-friendly. I absolutely adore the classy and simple, glossy black packaging of this blusher. 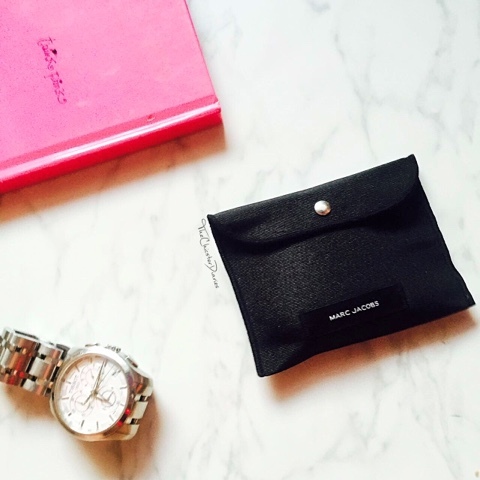 This gorgeous box comes with a fabric pouch which also has Marc Jacobs written on it. Inside this box, there is a super soft angled brush and a mirror that makes the application process uber easy. Color: The Rebellious shade was the most fascinating of all the 7 shades that were available. Rebellious is a cool berry tone with a lovely satiny finish. In spite being a cool tone, it works brilliantly with my sun kissed skin. It provides that rich yet soothing pink glow on initial application and can be built on if required. In terms of the color palette available, I think Marc Jacobs has truly been able to capture a bold spirit that is lavish, powerful and shameless. Texture & Staying Power: The blush is intensely pigmented so even the lightest swipe can get the perfect amount of color. Also, since this color is so pigmented you only need a little amount of it, making the product last for almost forever. The texture is really smooth and settles into a soft, satiny finish on application giving a naturally flushed finish. The lasting power of the blush is around 5-6 hours. Overall Verdict: This product is definitely a winner for me, in terms of the staying power formula, pigmentation and to a very great extent the color palette. 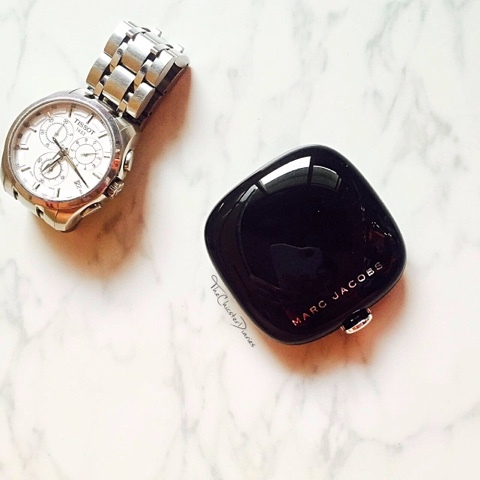 One of the best products from the house of Marc Jacobs. Hope you liked this review. Do share your views on the same and also, let me know in the comments section below which are your fave high-end blushes? 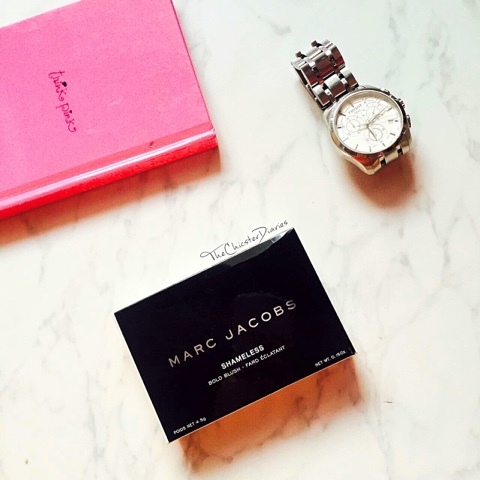 Have you ever tried any products from the brand Marc Jacobs? Such a pretty shade. Love the packaging too. so classy! !